There is a deep shine of pride and dedication in the black paintwork on the replica 1936 Toyota which sits boldly on its plinth at the company's Commemorative Hall in Toyota City. Inspired by the automobile industry in the US, Sakichi Toyoda pushed the family machine-powered loom business in a different direction and created what is now the world's biggest car maker. But the last few weeks have dulled the image Toyota built up over the decades as a bastion of quality, attention to detail, efficiency and trustworthiness. It has always been more than just a brand name or just another car maker. Toyota has embodied Japan's emergence from the ruins of World War II into one of the world's great powers. The company's values parallel the nation's ethos, and Toyota is a national icon. So there was more behind the deep bow of apology by Akio Toyoda, the grandson and third generation company president, than just "sorry". Unfortunately for most here in Japan, and in 60 or more countries where the recall has had an impact, what he had to say was just too little and too late. The accelerator pedal problem which led to the recall of millions of Toyotas worldwide was perhaps the most damaging. It is already expected to cost the company $2bn (£1.3bn), but the latest scare over the world's bestselling hybrid car, the Prius, has had more of an impact at home. The harsh headlines, cutting criticisms and investigations into complaints and accidents has hit Toyota's image hard elsewhere, but the problem cars were exported and the worldwide media furore had escaped Japan until now. 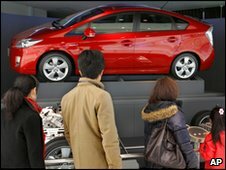 The slipping brakes on the Prius - which could still yet see hundreds of thousands more vehicles recalled - has now hit home as so many were bought in Japan under a government scheme to subsidise environmentally-friendly cars. Despite the tarnishing of the Toyota, Friday night's hastily-arranged press conference in Nagoya, an hour-and-a-half's bullet train ride from Tokyo on the other side of Mt Fuji, was the first time the company president had appeared to state his case. Japanese chief executives don't always come across as well as you would expect for such global players, and there were more questions than answers from a media pack hungry for snappy sound-bites. "The customer comes first," Akio Toyoda kept insisting, "and I must apologise to all our customers," but he left the details of what they were doing to his vice-president. There was still no clarity on the Prius brakes - simply an assurance it was safe as long as you pushed the pedal a bit harder, and a promise that if the company felt a recall was necessary, the customers would be the first to know. However, people here are still confused over why the newer models are having their software upgraded if everything is fine. For a hybrid car which effortlessly switches from engine power to battery power as required, it's a smooth drive. Test driving one of the questioned batch, I found the brakes to be more than responsive, but the man taking me through its pros and cons did admit there had been problems in the cold. Perhaps Japanese consumers are a little less militant than their American counterparts when it comes to taking up complaints or launching legal action. Some put it down to Japan-bashing from the political voices of the US automobile industry, but cars which won't stop accelerating and brakes which are slow in slowing you down do not make for confident drivers. 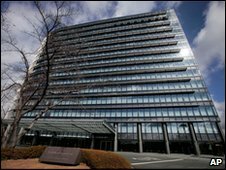 There is still confidence in Toyota City, which hosts the company headquarters and provides a living to families of a quarter of the population. "There will be some damage, but Toyota is strong and could even become stronger from the experience of this," said one man wrapped up from the cold and shuffling past one of the many factories in the city. Among the many museums devoted to the family name, and product, is a future showroom where two-legged robots welcome you by playing the trumpet in reception three times a day. Amid the high-tech visual displays is the emphasis on safety - a core of the company's reputation for so long. "Toyota's efforts are aimed at realising safe and worry-free driving," the voice says. In that regard, it has been hit hard around the world and will feel it in the company coffers for months or maybe even years to come. How to stop a car with a jammed accelerator?